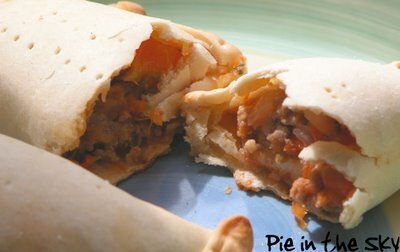 pie in the sky: Empanada Extravaganza! 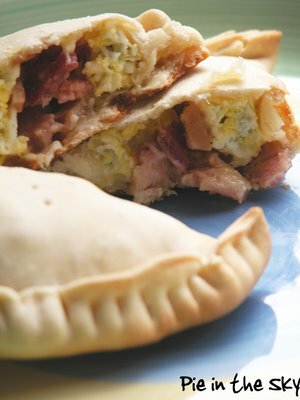 To me, empanadas seem like the perfect food. They’re small, tidy, and easy to make; they’re good hot or cold; they’re infinitely variable, so you never get tired of them; they’re good for any course of any meal of the day; they can contain any combination of food groups (vegetables, meat, cheese, fruit, chocolate); they can be inexpensive yet delicious; they’re a perfect solution for most leftovers. Leftover omelet? Chicken? Stir-fry? Put it in an empanada…eat it for lunch. And thus it was that the long-awaited empanada party finally came to pass…last night, in all its supremely versatile deliciousness. Pot-luck style, the party was structured thus: each attendee provides a filling of their own divining; dough wrappers would be provided. All the fillings were set out in a row on the counter with big spoons; each guest was given a lightly greased baking sheet and a stack of wrappers; and the Empanada Free-For-All commenced. 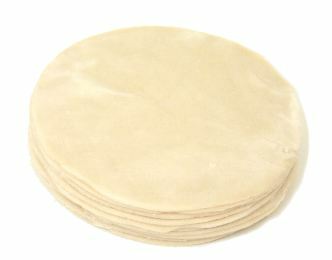 Warm disc of dough between hands until pliable; spread gently with palms. Place heaping tablespoon (or more!) of filling in center of dough. 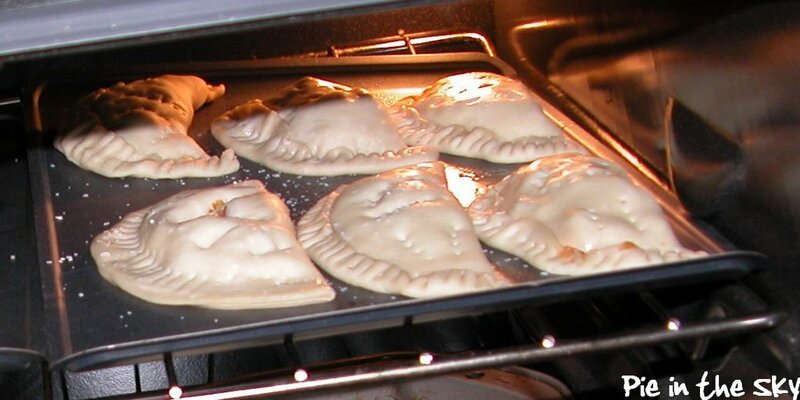 Arrange empanadas on dampened nonstick baking sheet. Prick top of each pastry several times with fork (for steam vents). Brush tops with egg wash (1 egg white whisked with 1 teaspoon water); dust with salt (or sugar, depending on filling). Bake for 8-12 minutes or until edges begin to brown. Serve immediately—but be careful, the filling will be hot! 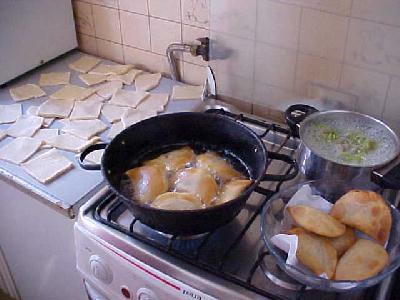 Empanadas can, of course, also be deep fried, but we stuck with baking due to the pot-luck nature of the party (and our personal health). A note on empanada dough: We used Goya flour wrappers because that’s what was available at our local grocery. Goya also makes cornmeal-based wrappers, which are better for frying. Alternatively, you can make the dough yourself. If you live in the East Village, Ruben’s Empanadas will give you a stack of 18 regular or whole wheat wrappers for $5.00, if you order them two days in advance. In a small heavy skillet cook leek in 1 tablespoon oil over moderate heat, stirring, until leek is softened. Add water and cook, covered, over low heat until leek is soft, about 8 minutes. Pour off any excess water. Remove skillet from heat, toss with bacon, and add salt and pepper to taste. Scramble eggs in remaining teaspoon of oil; remove from pan and toss with bacon mixture. Let filling cool completely and stir in cheese. Heat oil in heavy medium skillet over high heat. Add banana and sauté until golden, about 1 ½ minutes. Using slotted spoon, transfer banana to paper towels to drain. Add onion to skillet; sauté 3 minutes. Add beans, cilantro, and cayenne; cook until mixture is hot, about 3 minutes. Mash bean filling to coarse paste; fold in bananas. Season with salt. In a small heavy skillet sear shrimp in garlic and olive oil over medium heat. Remove skillet from heat and add cayenne pepper, coating shrimp evenly. Let shrimp mixture cool completely while combining grated cheese and chopped cilantro. When cool, combine cheese and shrimp mixtures. The Granada Turkey filling was provided by Glod, so I don’t have the recipe, but it was a delicious combination of ground turkey, fresh tomatoes, onions and wonderful spices. Alexis brought the fabulous rice and beans. 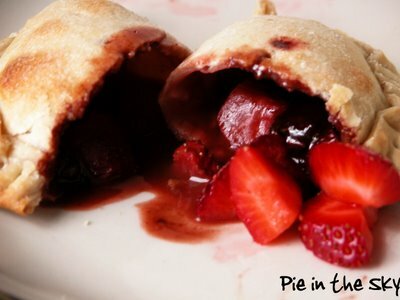 The Strawberry Empanadas were a dessert-y afterthought: I just put chopped strawberries, honey, a little sugar, and a small pat of butter inside the wrapper and dusted it with sugar. I made them again for breakfast this morning, but this time with an added spoonful of Nutella…mmm. Next time, I plan to try an apple-butter-cinnamon-brown sugar combination. Also appealing: strawberries, sugar and mascarpone! 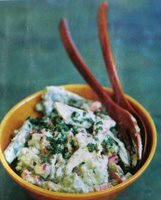 The coincidence whereby I concluded upon concocting a cactus (nopales) salad: on the way to the market, I bought the new issue of Saveur, and the recipe was inside, along with a short article about nopales traditions in Mexico and South America. When I got to Essex Street Market, I found they had cactus for sale! I brought it to the register excitedly. The woman behind it regarded me skeptically. “You know this?” she asks, holding up the cactus. “Oh, yes,” I say with false confidence. “I hope so,” I reply. “Don’t hurt yourself,” she warns, handing it back to me. Puree jalapeños, sour cream, ¼ cup of the cilantro, lime juice, and cumin in a food processor until very smooth. Transfer to a bowl, season to taste with salt, cover, and chill. Place each cactus base on a work surface, hold base with kitchen towel, and shave off thorny bumps on each side (and edges) with sharp knife. Blanch cactus and tomatillo in a large pot of boiling salted water over high heat. Remove tomatillo when tender, about 5 minutes, and transfer to plate. Cook cactus until tender, about 5 minutes more, rinse in cold water, and transfer to plate. Cut cactus crosswise into ½-inch wide strips and return to pot and let cook for 2-3 minutes more to remove excess slime. Drain cactus, rinse in cold water, and dry with paper towels. Transfer to bowl. Dice tomatillo and add to bowl. Add onions and peppers, season to taste with salt, cover, and refrigerate. To serve, halve avocado, discard pit and skin, and thinly slice lengthwise. 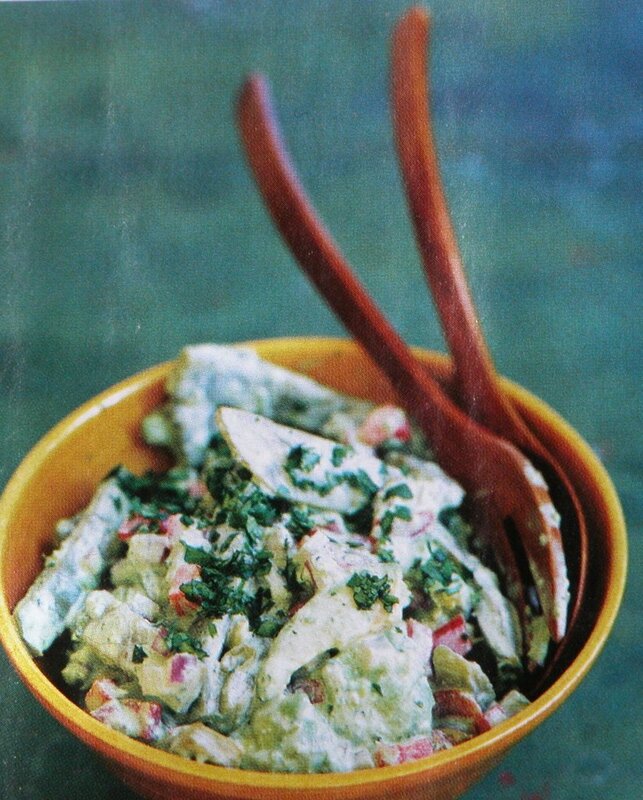 Toss together avocado, cactus mixture, and dressing in a serving bowl. Garnish with remaining cilantro. It was a delicious empanada feast. Hats off to all contributors! Man, these all looks so good. You should take up photography too. You're awesome. I’ve been at our N. GA cabin for a few days and am down to very limited food stuff. I had a hotdog on a stale hamburger bun last night for dinner...and to think, I could have had it chopped up with onions, tomatoes (or chili sauce), topped with grated cheese and baked in a rolled out biscuit disk...with mustard for dipping! Where are you, with the ideas, when I need them! :) Good blogging!